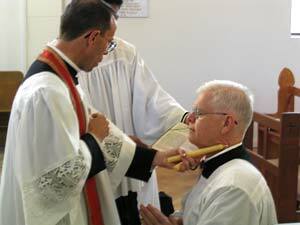 On February 3, the church celebrates the Feast of St. Blaise, Bishop & Martyr. At the conclusion of Mass it is a custom to take two blessed candles (we celebrated Candlemas yesterday) , hold them in a cross, place them around a person’s neck and bestow the blessing of throats upon them. There are many things that constitute as a sacramental. Scapulars, holy water, religious medals, rosaries, blessed ashes, palms, novenas, pilgrimages, devotions, blessed salt, statues, are all examples of sacramentals. I personally wear a miraculous medal as a sign of my Marian Consecration, an Ecce homo medal, my brown scapular with a St. Benedict medal attached, a rosary in my pocket, and use Holy water (and the rosary) on a daily basis. Sacramentals are great things, that really help us to grow in faith and keep us reminded of Christ, and the goal of our lives. 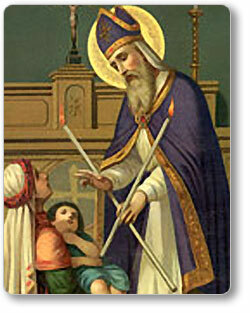 St. Blaise once healed a boy choking on a fish bone, which is why he is attributed with healing throats. For more information about his feast and his life, please visit here. So, find a parish around you that is doing the blessing of throats, and go get some extra grace in your life on the third! It can’t hurt!